Some time I ran into a problem with my layout Halifax Midland. I kept building rolling stock and locomotives so that the layout basically became over full. I’ve prevaricated for months over what to do. One possibility was to demolish my loft layout and build a big layout up there. In the end realism took over and I decided to double deck Halifax. I’d tried this a year or so ago and it hadn’t been successful because I’d made the boards too wide so the lower layout became dark and difficult to access easily. This time I’ve contented myself with narrower boards (only 12 inches wide) and the new layout is only an L shape and not a U. This means that the main station at Halifax Midland is still unobstructed and the new layout is only over the loco shed/goods sidings and the curving approach to the station. The basic concept is that there is a branch from Halifax to a small industrial town called Hebblethwaite. The Hebble is a river at Halifax and thwaite is a very common part of place names in Yorkshire. Local trains run from Halifax to Hebblethwaite – these will be either bogie suburban or 6 wheel clerestory coaches. Goods trains will be trip workings from Halifax to serve the various woollen mills in the valley. 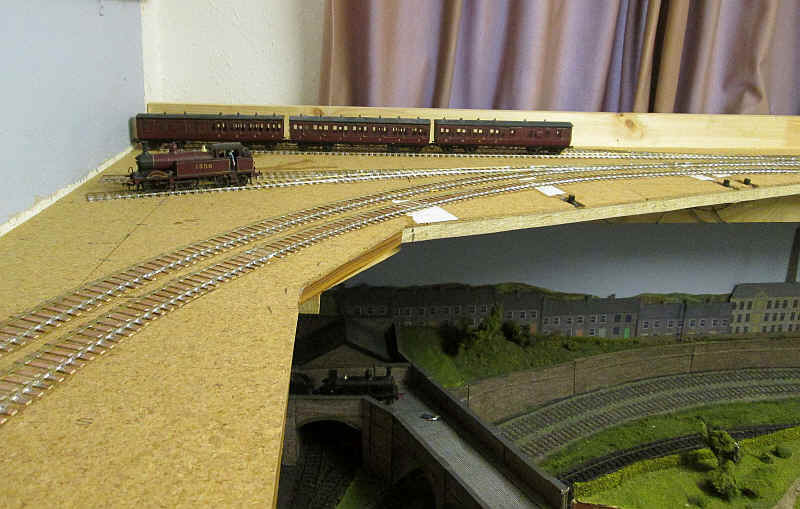 The layout starts from a single fiddle track above the existing Halifax fiddle yard. I’ll simply transfer stock by hand using an adapted Peco OO re-railing ramp. Once out of the fiddle track trains pass a four track warehouse area and then round a very sharp, 36” radius curve into the 2 track island platform. The curve is double track as this forms the station’s run round. There is a 2 track loco shed and 2 carriage sidings. 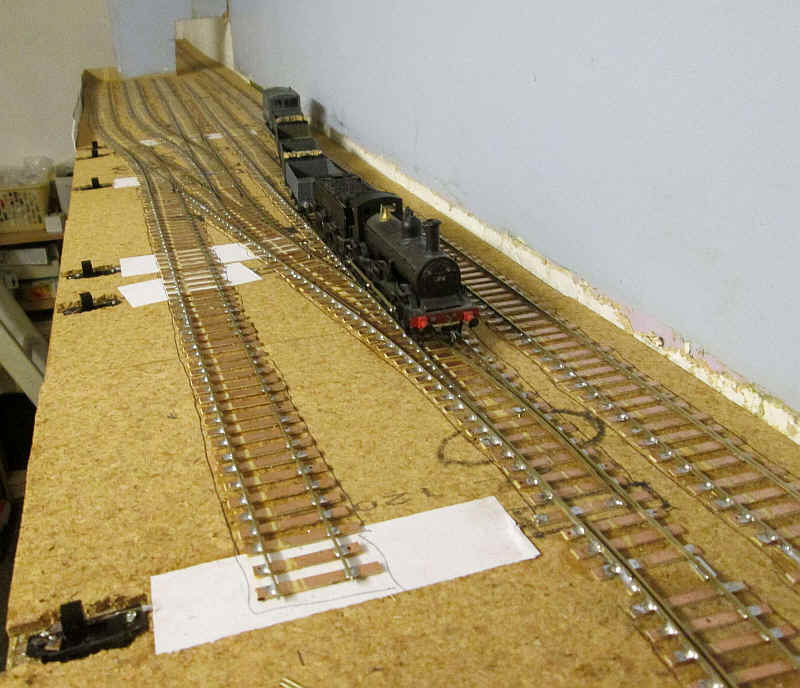 All the track is now laid, wired up and ballasted so I have an operational layout. Almost all my locomotives are happy running round the tight curve although some of the bogie coaches are less happy as their wheels catch on the back of the solebars. This isn’t really a problem as rakes of 6-wheel using the Society’s Cleminson underframes will provide most local trains – the ones I’ve built have no problem with 36” curves. The bogie coaches will receive attention to their underframes if I can be bothered! 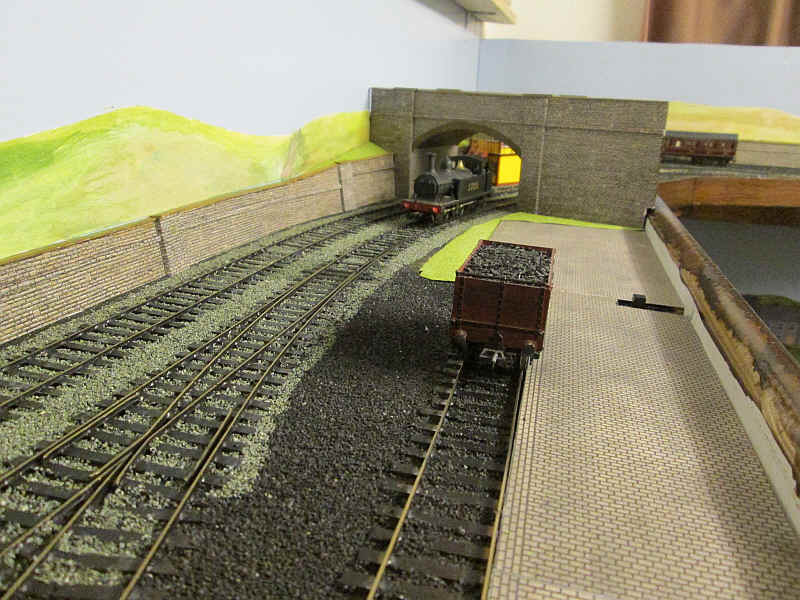 The first batch of photographs show the layout before ballasting. After a lot of testing I started on my least favourite task of layout building, which is ballasting. The track was sprayed black using a can of matt black car spray and then after cleaning the rail head and testing the running again. I started spread neat PVA between the sleepers and then pouring Woodlands Scenics N scale ballast onto the glue. The yard areas are generally finished in "ash" with running lines and carriage sidings in grey chippings. This task drives me to distraction so I resolved to do 20 minutes a day until I finished. Spare ballast is picked up by a handheld vacuum cleaner and reused. So far I haven't attempted to weather the track as this will be done after finishing the scenery. 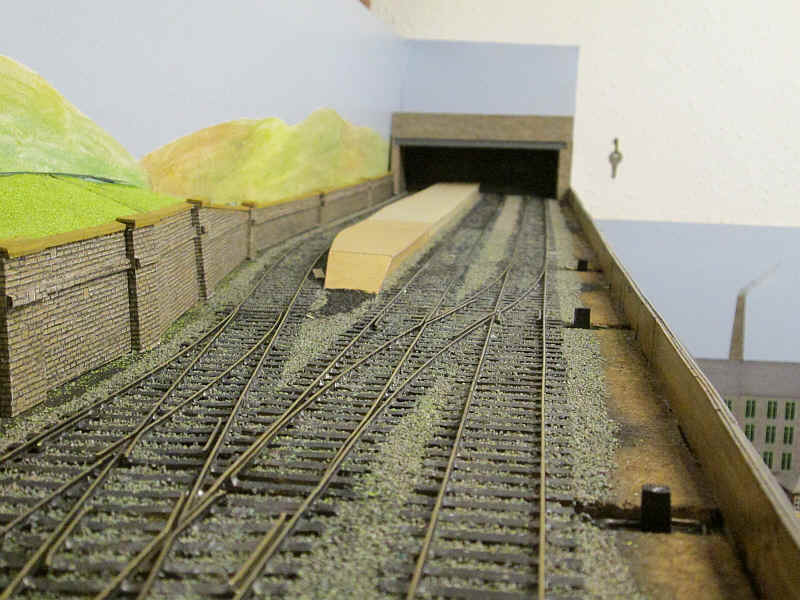 As the baseboards are only 12" wide on the goods depot side and 10" wide on the station side I've had no option but to rely heavily on stone retaining walls again and a back scene to try and give a little depth. I've used Metcalfe stone card again 9as on Halifax Midland but this time I designed in a little more space to allow the walls to slope a little more, which obviously is more realistic. The goods depot ends in a two road warehouse which is vaguely reminiscent of some of those in Airedale. The area around the track in the depot has Metcalfe setts butted up to the rail. This needs heavy weathering to make it look less stark. Unfortunately, the point control slide switches intrude but on a layout of this size there's little alternative. The back scene is simply wallpaper cut to the shape of the Pennine hills and painted with water colours. In due course I shall add a few computer generated buildings for the back scene. In the photo below the first of these, a typical West Riding stepped terrace can be seen. I've put a road bridge across the beginning of the curve into the station to break the about up. It has the effect of making the layout seem much larger than it is. 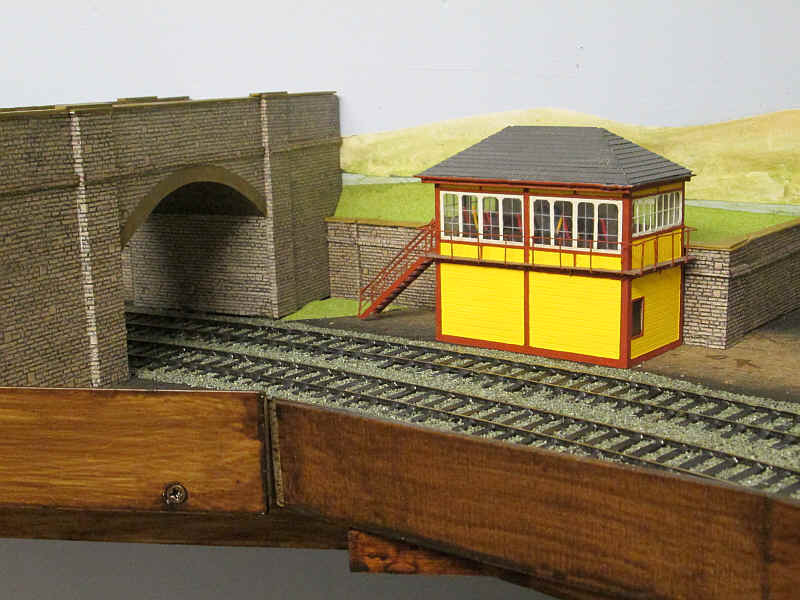 A Churchward etched signal box kit will control the layout's signals and points from it position next to the bridge. The box has window frames made from self adhesive labels cut out with a scalpel, with the glazing bars being scribed into the plastic glazing and filled with paint. There's lots more to do but at last Hebblethwaite begins to feel like a real railway. The goods station with the single line to the fiddle track on the right. Looking towards the road bridge. 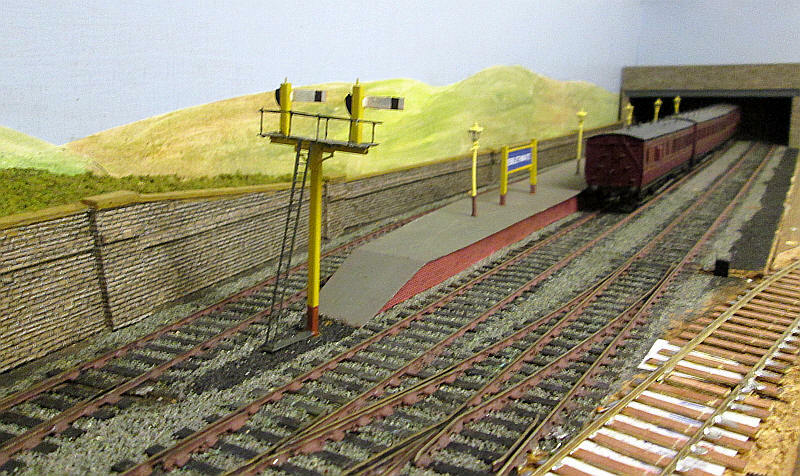 The road bridge and the scratchbuilt signal box. The framework (seen painted brown) and stairs are made out of nickel silver strips. The rest of the structures is from scribed plasticard whilst the roof has Metcalf Models slate card on the outer surface. This photo and the one below show the two loco sidings and the two carriage sidings. This photo shows the station itself with two platform roads, the goods line and loco release crossover on the right. Once again a change of plan has happened. For as long as I can remember I've been fascinated by German railways and having modelled them in Z, N, TT and HO I decided that the time had come to build a layout in S Scale. This would have to be totally scratchbuilt. A one foot wide baseboard was built above Halifax Midland station for a small branch terminus layout. This was linked to Hebblethwaite with a curve as can be seen in the photo below. 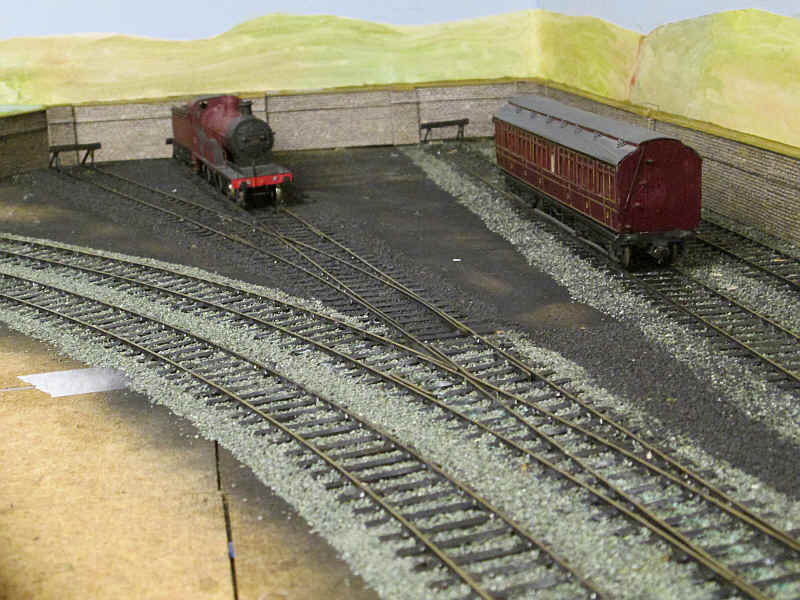 The German layout would use the same fiddle area as Hebblethwaite. The station has progressed a little further with the non functional signals and basic platform furniture in place. 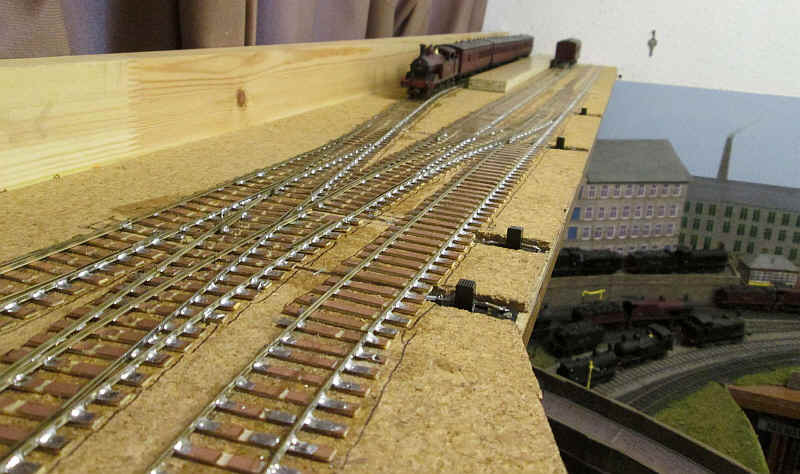 The unpainted and unballasted line on the left leads off to the latest extension of the layout ( a German branch line station) which is described here. As described on the linked page above a removable scenic section allows the layout to function either as a British or German layout with the removable section allowing operation in the British mode visible in this photo. All this comprises of is a triangular raised grassy area surrounded by low retaining walls. 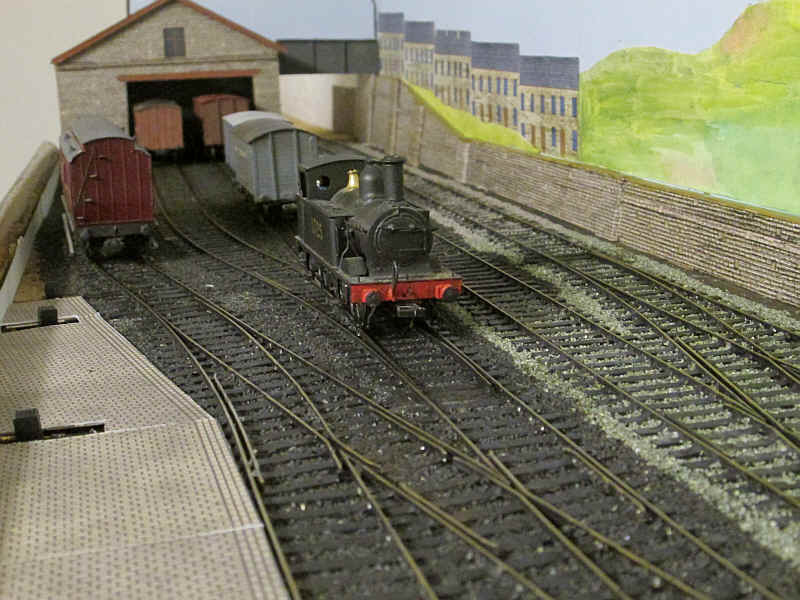 Hebblethwaite as a British Railways era layout. Originally, I had intended Hebblethwaite to be an extension of Halifax Midland with Midland Railway stock. However, having obtained a quantity of the former Alan Gibson LMS loco kits, and more significantly having regained most of the dexterity in my right hand following nerve damage, I've decided that Hebblethwaite will be a late 1950s/ early 1960s era layout. Of course with the link to the German branch terminus the storage/ fiddle track area also has to double up for use with that stock. It's possible to operate trains of three 57' long coaches on the layout but to do this I needed to lengthen the storage track area just as I'd done on Halifax Midland. The same method was chosen by shortening the goods sidings by about three wagon lengths. I chose an almost identical way to do this with a road girder bridge, this time glued directly on to the backscene board. The sidings disappear under the bridge by just over one wagon length. In the background the four levels of the layout can be seen. At the bottom is Halifax Midland's fiddle yard with its drop down shelf in the raised position. Above is a shelf containing about 20 MR layout wagons. 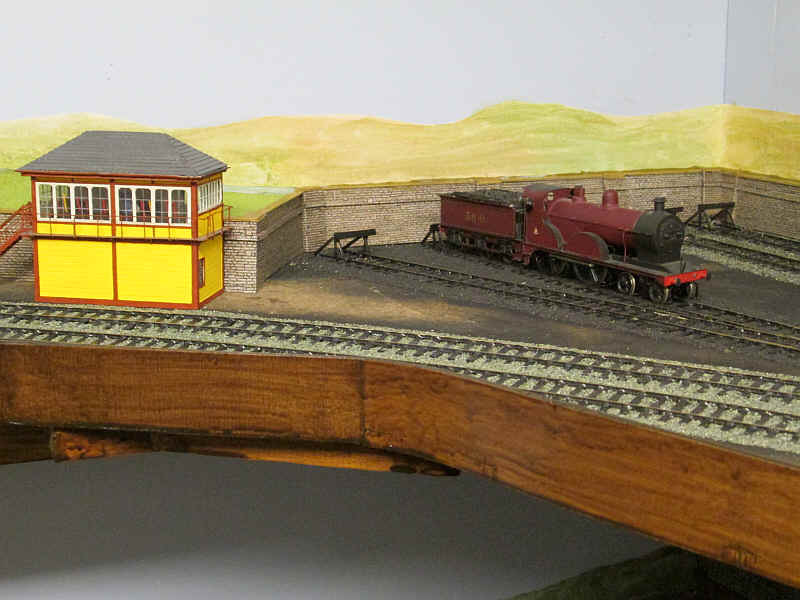 The three carriages are in the Hebblethwaite fiddle area whilst above on the top shelf are some German models. I suspect another shelf will be necessary for BR wagons. Looking the other way, the coal wagon unloading siding can still be accessed from its headshunt. The changes mean that I have lost about 9 wagon lengths of space in the yard but overall operation will be much easier with good access to the fiddle/ storage area. Hebblethwaite's scenery is to be developed to give the impression of a fairly substantial town, mainly using the backscene for this but also by giving the platform a canopy. MR items of scenery will be changed to be suitable for the BR era. I'm also probably going to relocate the layout into the London Midland Region possibly somewhere in the north Lancashire area around Colne or Burnley and with the town name Pendleton as a play on the name of the hill nearby - Pendle Hill . The operational plan at the moment is for two sets of carriages; one will be a three coach suburban rake and the second will be a three coach Stanier period 3 corridor set. Motive power will be 2-6-4Ts for the locals and tender engines for the corridor trains. Already built are a Fairburn 2-6-4T, a Crab 2-6-0 and a Patriot 4-6-0. The station will have a pilot loco in the form of a ex-MR 3F 0-6-0T "Jinty" which was one of the locos that Alan Gibson sold me. Still in kit form are a 4F 0-6-0, an 8F 2-8-0 and a Stanier Class 5. There's also an EE 0-6-0 350hp diesel shunter kit for a real challenge! Freight stock will be partly kit built - etched brass BR/ LMS brake vans, LMS vans and opens together with cast metal BR 16T coal wagons. Other freight wagons will need to have scratchbuilt bodies. 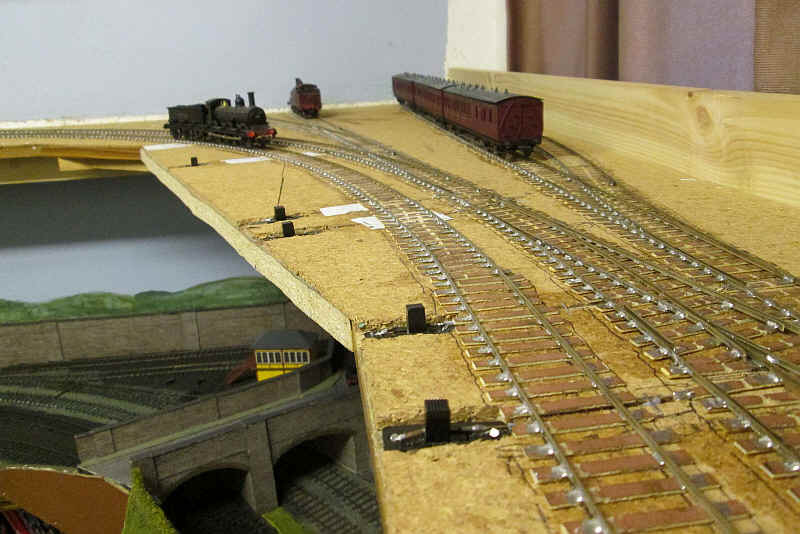 The first steps have been taken to move the layout into the British railways era. The removeable scenic board has been modified to give a third platform face, which is intended for parcels vehicles.